We didn't always know that asteroid impacts were a modern-day possibility. In fact, this realization didn't come until scientists started proving that many of the craters on Earth were caused by cosmic impacts rather than volcanic eruptions (and similarly for the craters on the Moon). In the 1980s, scientists discovered evidence that the demise of the dinosaurs 65 million years ago was likely caused by an asteroid impact. After scientists found the Chicxulub Crater in the Gulf of Mexico, this idea became more certain. In 1994, the world witnessed similar-sized impacts happening in near-real time, when fragments of comet Shoemaker-Levy 9 impacted Jupiter—that's when we really started to understand that large asteroid impacts could still happen today. Every day, roughly 100 tons of interplanetary space material rain down on our planet, most of it in the form of tiny dust particles. Small planetary debris the size of grains of sand, pebbles and rocks also rain down daily into Earth's atmosphere, producing the meteors—commonly called "shooting" or "falling stars—that you can see on any dark clear night. Occasionally, Earth passes through denser streams of small debris released from comets—that's how we get meteor showers. Sometimes larger, chair-sized or even car-sized space objects enter Earth's atmosphere and create really bright meteors, called fireballs or bolides, which disintegrate as they explode in the atmosphere. Very rarely, every few decades or so, even larger objects enter the atmosphere, such as the house-sized object that streaked across the sky over Chelyabinsk, Russia, in 2013, producing a super-bright fireball and a shock wave that blasted out windows and broke down doors. You may have heard about an asteroid or comet making a "close approach" to Earth. That happens when the object in its natural orbit about the Sun passes particularly close to Earth. There's no firm rule on what counts as "close," but it's not at all uncommon for small asteroids to pass closer to Earth than our own Moon. That might seem too close for comfort, but remember that the Moon orbits Earth about 239,000 miles (385,000 kilometers) away. If you represented Earth by a basketball in a scale model, the Moon would be the size of a tennis ball and about 21 feet (7 meters) away—the distance between the two posts of a professional soccer goal. At this scale, a 100-meter-wide (328-foot-wide) asteroid would be much smaller than a grain of sand, even smaller than a speck of dust. There's currently a NASA mission called OSIRIS-REx studying a near-Earth object up close—an asteroid named Bennu. 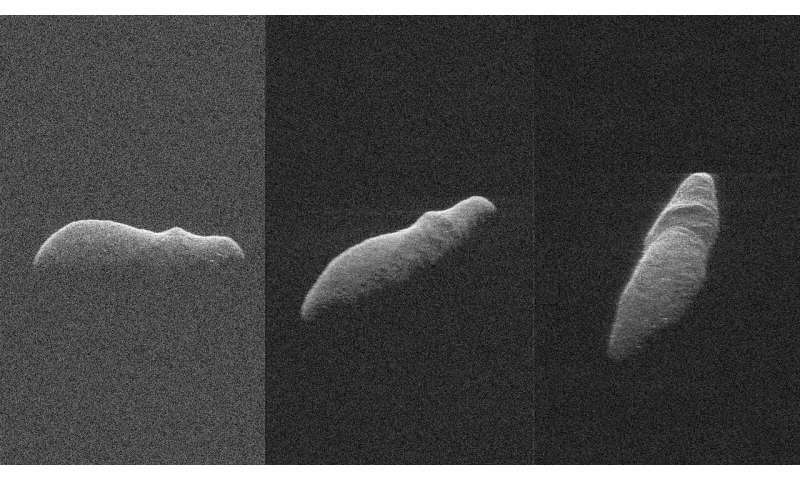 Scientists recently calculated that this asteroid has a 1 in 2,700 chance of hitting Earth in the late 22nd century (that's over 150 years away for now), but it has no chance of impacting any time before then. Right now, OSIRIS-REx is orbiting the asteroid and studying its surface to prepare to take a sample and return it to Earth in 2023. The spacecraft is also studying a phenomenon called the Yarkovsky effect—which is a small force that shifts the asteroid's orbit slightly as its Sun-heated surface radiates heat back into space. By studying Bennu close-up with OSIRIS-REx, scientists will be able to understand just how much heat is being radiated from the various parts of the asteroid, which will help them ultimately better understand the Yarkovsky effect and better predict Bennu's orbit and its possible hazard to Earth. Asteroid impacts are the only potentially preventable natural disaster—provided we spot the threatening asteroid with enough lead time to launch a mission into space to deflect it. NASA and its partners are studying several different approaches to deflecting a hazardous asteroid. The most advanced of these techniques is called a kinetic impactor, and a mission to demonstrate this technology is called the Double-Asteroid Redirection Test (DART), is slated to launch in 2021. If a hazardous asteroid is found a decade or more before a potential impact, there would likely be time to launch a deflection mission to the asteroid, and we would only need to shift its orbit by just a bit—just enough to make it cross Earth's orbit only about 10 minutes "late," so to speak—to avoid the collision with our planet.